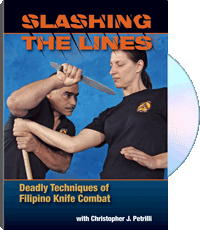 In this video, Doce Pares Eskrima Grandmaster Christopher J. Petrilli takes the highly evolved skill set he demonstrated in the best-selling videos Crashing the Lines and Cutting the Lines in a brutal new direction: knife fighting. The foundation is a blade form that merges slashes, stabs, cuts, and throws into a lethal flow of combat effectiveness. Taking the form piece by piece, Grandmaster Petrilli teaches the principles behind each motion and movement, showing a myriad of applications that can be used both offensively and defensively. The material can be applied to any length of blade, from close-range sword and machete techniques to lightning-fast dagger thrusts and cuts. Expanding the curriculum further, he also teaches stick and empty-hand applications, making you almost unbeatable in close-quarter combat. Whether you are armed or unarmed, facing an opponent bearing a knife or stick, this video will teach you a fighting system you can't afford to be without. For information purposes only.